The stories collected in one of DC Comics's final "Edge" line titles, GI Combat Vol. 1: The War That Time Forgot, seemed to me to be an attempt to grab the audience that didn't quite cotton to Men of War by telling war stories with a little more superheroics than Men of War had. "War That Time Forgot," "Unknown Soldier," and "Haunted Tank" are all war concepts with a twist, and as someone who enjoys faux reality superhero titles like Checkmate and Gotham Central, I held some optimism for GI Combat. Even as the writers here are accomplished -- JT Krul, Justin Gray and Jimmy Palmiotti, and Peter Tomasi is a good group -- GI Combat never quite emerges as a cohesive package. It is at times too flip, at times too brief; it is constantly dark and bloody; and it's also adrenaline-soaked ad nauseam. Maybe this is the aesthetic of war comics and war comics just aren't for me, but I couldn't recommend this volume. 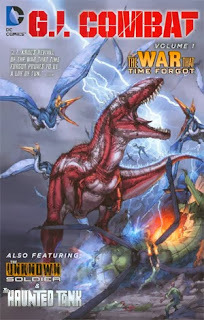 The best thing about the titular story, "The War That Time Forgot," by JT Krul and artist Ariel Olivetti, is the dinosaurs, and possibly they're the best thing about this whole book. Olivetti's dinosaurs are realistic, scaly, and fearsome, and the whole thing left me with a craving for a Jurassic Park re-watch. Unfortunately, the humans in Olivetti's panels aren't depicted as well; at some times the characters seem to stare off into space, and at other times script and art seem to get away from one another with extra panels where the characters just stand or point. Krul's characters Stevens and Elliott are the first example of the book's adrenaline-soaked aesthetic, two manly men fighting to get home to their wives (there are women in GI Combat but they rarely if ever take a combat role). It's almost comical when Elliott can't understand why Stevens gives a gun to a North Korean solider trapped on the dinosaur island with them rather than just killing the man in cold blood. In a twist vaguely Lost-esque, Elliott sets off from the island in a raft into monster-infested waters, thinking Stevens dead, while Stevens slowly loses his humanity ... and then the story ends. For whatever reason DC decided to switch the title's contents at that time, it brings the story to a close seemingly without closure. I had hoped for an acknowledgment, at least, that this dinosaur island was the same as seen in then-recent issues of Teen Titans, but such is never addressed. Gray and Palmiotti's "Unknown Solider" is to some extent a Boondock Saints-type piece, in which the superhuman Solider kills legions of terrorists, drug dealers, and madmen without much difficulty, and the vicarious "enjoyment," if any, is watching the bad guys get theirs. "Soldier" is the most thoughtful of the three stories, as it were, delving into the mystery of the Soldier and whether he is a wounded security contractor or the reincarnation of an Unknown Solider that's fought in every war; unfortunately the authors tease here more than they reveal. The story tries to interject a "not all Muslims are terrorists" message, but it comes off less authentic and more apologetic for the disturbing amount of Middle Eastern-looking men that the Soldier murders in these pages. "Unknown Solider" is ultimately both too long and too short for what it tries to accomplish. There's a storyline regarding how the Soldier's handler Agent Komal has implanted him with false memories, but nothing comes of it because, in the backup story format, the action is focused on the Soldier to the exception of everything else, as opposed to how an ongoing series might be. At the same time, the main action grows ever more bloated and complicated, as the Soldier hunts a foreign terrorist that turns out to be related to domestic gun smuggling that turns into a plot to destabilize the financial markets being run out of a video game company. Almost the exact same scene happens twice in two issues as the Soldier is uncovered as a secret agent; the "mole" selling state secrets is exactly who the reader would think it is, the disgruntled agent who gets mad at Komal earlier. And then the story ends. The Unknown Solider accidentally kills a target he was supposed to capture, then suddenly he's gone back to the house where he used to live, meets the family that lives there now, and that's the end. Is the Unknown Soldier a man or a reincarnated spirit? Does he still work for AMMO (as if the DC Universe needed another acronymmed organization) or what are the consequences of his latest mishap? The reader never finds out, though here, at least, the Soldier's adventures continue into Suicide Squad (what brought me here in the first place). "Haunted Tank" is by Tomasi with art by Howard Chaykin, which I'll acknowledge is a fairly epic combination. I've never quite been able to get into Chaykin's art though, personally, going back to some of the weirdness on his Hawkgirl title. But on the second page of the "Tank" story, for instance, there's these spheres on the ground in Jeb Stuart's front lawn. Are they mines? Ant traps? Why does one seem to float half off the ground by the boy's leg in the first panel of that page? A small thing, sure, but immediately I felt no more comfortable with Chaykin's art in this story than I had before. Tomasi's story, in which the elder Stuart and the Haunted Tank rescue Stuart's grandson before he passes on the Tank legacy, is very occasionally moving, though more often befuddling. The initial sequence in which the Tank bowls over cars on the way from Argus's Black Room to Stuart's house is comical, though perhaps it's not intended to be, reminding me of something out of Herbie, the Love Bug. The elder Stuart spends the entire story shirtless, often with an American flag falling across his bare back like a cape; it comes off ludicrous (even a hair offensive), and again I'm not sure that was the intent. As with "Unknown Solider," there's a bevy of gunshots, stabbings, and the amputation of limbs here; Steve Trevor makes an appearance in Agents of SHIELD fashion, but it's not enough to save a story that just doesn't come together (though this one, at least, has a conclusive ending). In considering GI Combat Vol. 1: The War That Time Forgot, I'm put in mind of Sword of Sorcery Vol. 1: Amethyst, a collection of another of DC's recent anthology series, also cancelled, and collecting three stories. Sword of Sorcery, however, gave us strong characters and stories to get into; "Amethyst" was very detailed and "Beowulf" was creative and well-drawn; for the record, "Beowulf" was pretty bloody, too. But while Sword of Sorcery felt like an adventure, GI Combat comes off very dank, with page after page of the heroes of the pieces killing armies of villains. Maybe this book is for someone else, but it wasn't for me. 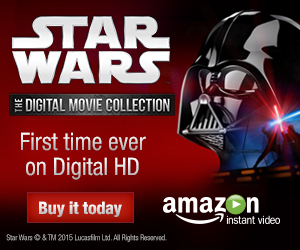 I just can't get into anthology titles. No matter how good the talent is I always feel like I didn't get a complete story and am left feeling unsatisfied.